Heart My Hobby: Creative Genealogy Scrapbooking Challenge #43...Me & you. 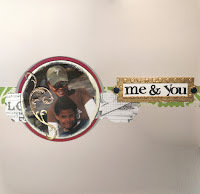 Creative Genealogy Scrapbooking Challenge #43...Me & you. Our sketch challenge at Creative Genealogy Scrapbooking has posted late because our sketch master Rowena had a family emergency. Rowena, we hope that everything is OK with you and your family. I didn't journal anything because this is my sons favorite picture of us when he was younger, so I am going to let him right his thoughts or memories down. Isn't that a wonderful sketch? I think that anyone and everyone should participate this week. I hope to get a chance to come by your blogs and see what you have created with this weeks sketch. Have a great afternoon.....I'm off to football practice. Love your layout. The scroll design is so pretty.